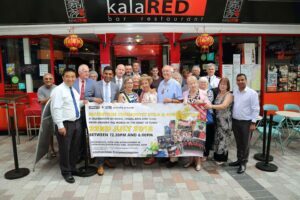 A special launch event for Maidstone’s 2018 Community Mela took place at the kalaRED bar restaurant in Maidstone on July 5th. The Community Mela and Food Festival celebrates music, visual arts, food and dance from around the world. The launch event was attended by key partners including representatives from local community groups, Kent County Council, Kent Police and Maidstone Borough Council. 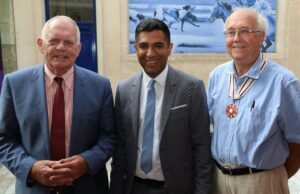 Guests included Deputy Lieutenant Trevor Sturgess DL who was representing the Lord-Lieutenant at the event, the Mayor of Maidstone Cllr David Naghi, and KCC Cabinet Member for Corporate and Democratic Services Cllr Eric Hotson. The purpose of the launch was to update partners around the plans for the Community Mela this year and to inform them of the journey it has been on to raise the required funds for the event to take place again. The Community Mela is organised by Cohesion Plus and Kent Equality Cohesion Council supported this year by funding from Awards for All, KCC Members Fund, Golding Homes as well as donations from members of the public. The Mela has been taking place in the borough since 2003 and is delivered in partnership with local partners and volunteers who have all worked tirelessly to ensure that Mela will take place again this year.